A fellow engineer tells you he thinks the controller is over-tuned (having too much gain). The operator, who just did the manual-mode test, disagrees. Based on the information seen in the trend, what do you think the source of the oscillation is, and how would you go about testing your hypothesis? 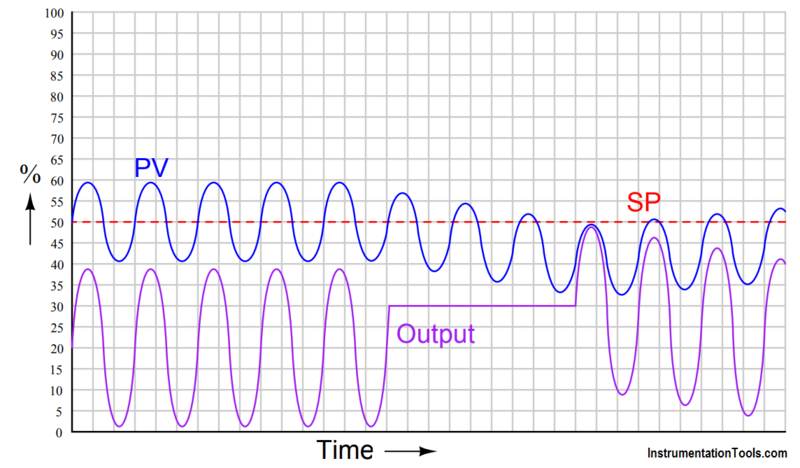 This oscillation is clearly not the result of an over-tuned controller, because it persists even when the controller is in manual mode. The source must be coming from somewhere else in the process. At this point in time, it would be a good thing to note the frequency of this oscillation, and begin searching for anything that could cause the level to go up and down at this frequency, or perhaps something that could “fool” level transmitter (LT) into thinking the level is oscillating at this frequency. If the frequency is relatively high, local machine vibration could be the cause of it. This hypothesis makes a lot of sense, based on the fact that the controller’s action in automatic mode doesn’t seem to be correcting the oscillations at all: the oscillation amplitude seems to remain unchanged between automatic and manual modes. This is what we might expect from a vibration-induced oscillation, where the frequency of the oscillation is much faster than the liquid level can possible change, and therefore faster than the level control system can physically compensate.